Wirral Window Cleaning doesn’t just clean your windows; they can clean all of your exterior uPVC too! If you have been searching for fascia cleaning Wirral, then look no further! Get the dirt, dust and mould cleaned off your fascia boards, barge boards, soffit and guttering. Wirral Window Cleaning can use their expertise to clean all these for you using kind and gentle cleaning techniques which are not detrimental to your property in any way. We use a professional PVC cleaning solution if required – an exceptional cleaning product designed to remove all dirt and grime from uPVC. Upon application to your property’s uPVC, the cleaning solution will begin to break down the dirt & mould making it much easier to remove. The area will then be cleaned with specialised cleaning equipment and water. The PVC cleaning solution used will leave a slight sheen on your property’s fascias, soffits and barge boards. The sheen will provide a protective layer against any further build-up of dirt & grime as well as being more pleasing to the eyes. Wirral window cleaning clean fascia boards soffits and bargeboards using low-pressure cleaning methods. We clean fascias, soffits, bargeboards and gutters using a gentle and effective method. In our opinion, it is the most superior method for cleaning your uPVC fascia and soffit. The technique we use does not harm your PVC in any way and is not destructive and does not force water into areas in your roof space like jet washing cleaning methods can do. A Few Reasons why we do not use a power washer for cleaning fascia’s. Power washers use pressurised water to clean surfaces. In some instances, the water may find its way into air vents and roof space such as an attic. Areas such as the roof space are an unheated area. No heat in your attic can create mould and damp in the area caused by using a power washer to clean fascias and soffits. Using power washers to clean old or poorly fitted PVC panels can cause them to become loose using the high pressured water. If a power washer is being used to clean fascias, bargeboards, and soffits, there is a high risk of the pressurized water being sprayed onto your painted house. High pressured water can cause paint to flake off under the high pressured water. Anyone with any experience of using a power washer themselves will know that the pressure can cause paint to come away from the surface it is applied too. Power washers blast dirt everywhere! If you have a light coloured painted house, it can get very dirty very quickly when a power washer is being used within the area. All the dirt being blasted off the fascia boards and barge boards will cover your nice clean exterior painted wall. If you are using chemicals when cleaning with a power washer, it doesn’t do a very good job on the uPVC. If chemicals have been applied to fascias or soffit then when it is being cleaned off with the power washer the spray can cover a large area around your property. Grass, flowers and trees may die depending on the chemicals being used. How often should you clean your fascias soffits and gutters? Cleaning these areas is dependent upon where you live. 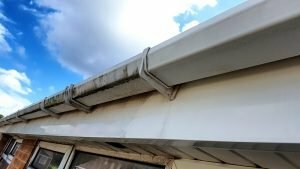 Properties situated on a main road will understandably get dirtier fascia’s and soffits due to exhaust fumes from passing traffic. Many people have them cleaned once a year to keep on top of dirt and grime while others choose to get them cleaned less often. It is very much personal preference and how disappointed you are looking at them. Many people who are thinking of selling their home will have these areas cleaned as it will enhance the look of the property and increase the chances of selling. When we refer to fascia cleaning what we mean is all the areas within the roofline of your property. All fascia boards, soffits, gutters, downpipes and bargeboards are on your roofline. All these parts of the roofline are cleaned in the service we refer to as fascia cleaning. Does the fascia cleaning leave any mess behind? This question crops up now and again by new customers. It is understandable that people may be concerned that all of the dirt and grime running down the fascia boards and soffits may go down the exterior walls of their property or settle on the path around the property afterwards. This has never been a problem for us due to our cleaning and rinsing techniques. How much will it cost to have fascia boards cleaned? It is quite difficult to give prices online or over the phone. Prices depend on the size of the property and how much dirt and grime need to be removed. Wirral window cleaning will call at your property and will give you a free no obligation quote once the property has been assessed. We can provide you with a written quotation and post it through your letterbox, or we can call or text you back with your quotation. If you are happy with the quote you were provided, then you can get in touch with us, and we can agree upon a date to commence the cleaning. If you are not happy with the quote you were provided with then you can simply ignore the quote, we do not believe in high-pressure sales. We strive to provide very competitive pricing for fascia cleaning Wirral. We have many years’ experience with fascia cleaning and have invested in specialised equipment to do the job properly.